Dawn's Crafting: I'm Back With A Card! Hi Guys, I'm back again finally! Christmas bits & pieces for various different things! Anyhoo, here is the card I'd like to share with you today! The quality of the kit is amazing & it came with lots of brilliant embellishments. The ribbon, feather & button are all from the kit too! I did add an extra butterly from my stash! design papers from the kit as well as some black & white cardstock. I hope you like it! Thanks so much for stopping by my blog! I've missed posting but have been so busy I just haven't had time! Then, it will be on to the wrapping up! Fabulous, elegant, monochromatic card...just so beautiful. This is a fabulous card Dawn, I love the black and white combination. Fabulous Dawn, love this kit and your embellishments work perfectly. Love monochrome too. Hey Dawn!! I love your card the colors, the dark and light contrast. Your image is pretty too. My favorite is the butterfly, I love it. Thanks for joining us over on the DoubleClick Skittles Challenge. Dawn, how lovely and elegant this card is. I love the black and white. Fabulously elegant and scrummy. Thank you for joining us over at the Scribble and Scrap Challenge. Good luck. Beautiful card. Love that black and white look. Thanks for sharing with us at DoubleClick Skittles. Gorgeous! Thanks for joining DoubleClick Skittles Challenge! So pretty Dawn is your card and l see the inside is done too l always think it finishes the card of beautifully when that's done too! Very classy in Black and White-love the patterns! Thanks for playing along with us at Southern Girls Challenge as we celebrate our 100th Challenge! A lovely card Dawn. Love the monochrome look and the elegant feel. 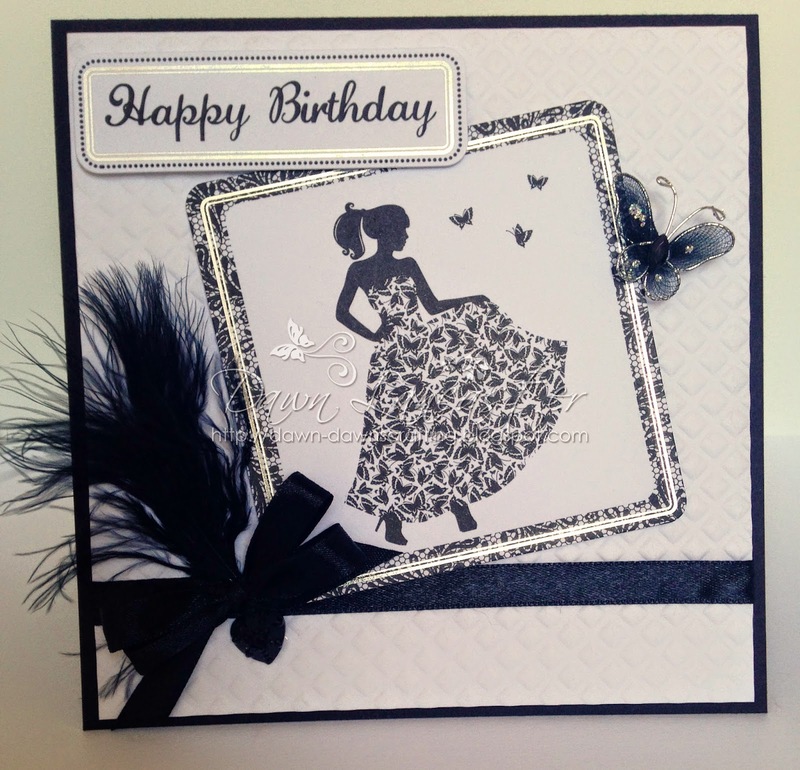 Elegant black and white card, inside and out! Love all the added embellishments. Thanks so much for joining us at Seize the Birthday! 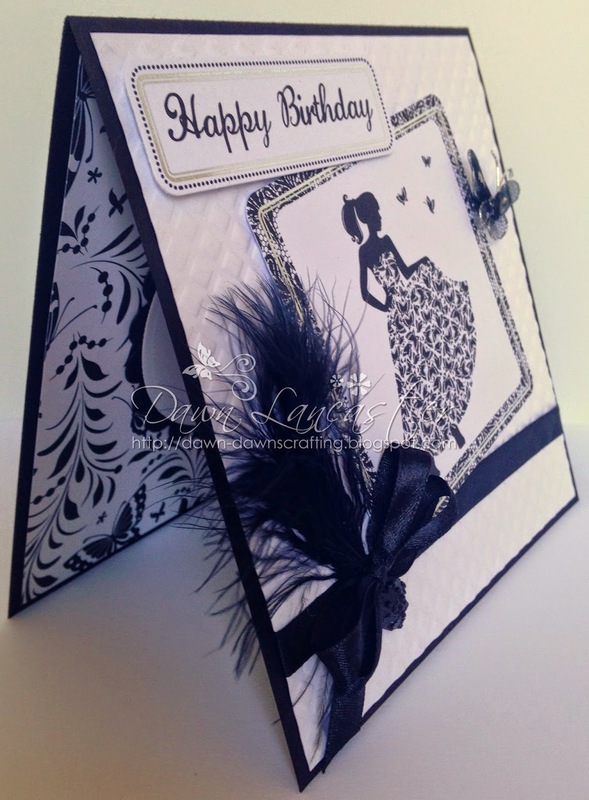 Such a fabulous elegant card with the black and white and awesome feather! Such an elegant card! I love that feather :) Thank you for sharing your beautiful project with us at Creative Card Crew this fortnight! Black and white...beautiful combination! Wonderful image and butterfly! It's a very elegant card! Thanks for playing at Crafts Galore Encore Challenge. Dawn this is such a beautifully elegant birthday card with the black and white. Wishing you and your loved ones a blessed festive season and a 2015 filled with tons of love and joy.